It's a bird.... no wait. It's a plane? It's a watermelon airplane fruit bowl! Ditch your tired glass bowl for a more festive fruit display that your friends will go gaga over. The best part? You don't even have to wash it. Pro tip: We found that 10 shortened skewers, cut in 1/3 pieces worked better for holding the wings. 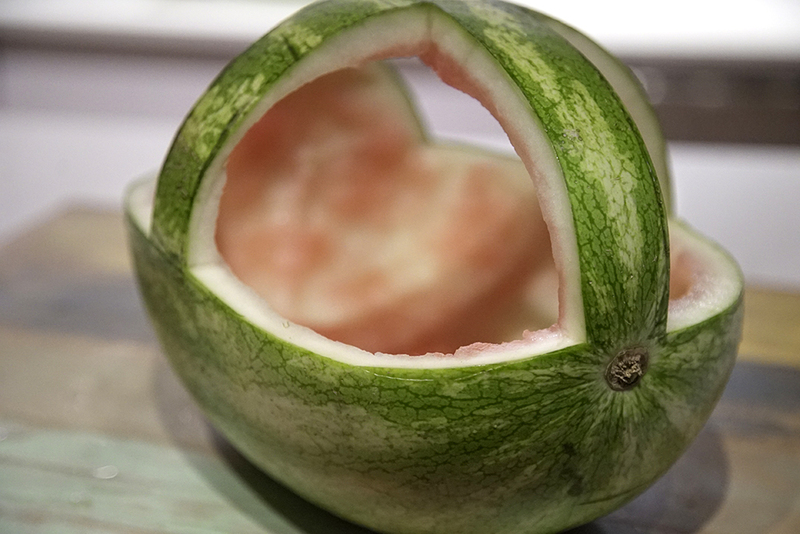 Even as amateur watermelon cutters, we found this treat to be pretty easy to carve up. Pro tip: Cutting a thin slice off the bottom of the watermelon will keep it level. Scoop out the rest of the watermelon and set aside for filling your awesome airplane bowl. Using the leftover rind from the (larger) back windows section, cut out wings. Secure to the sides with the pointed ends of the toothpicks or shortened skewers. Using one of the the smaller front window pieces, cut a propeller. (See below). You can’t get off the ground without your wheels! Stick those kiwi tires to the bottom of your bowl. Fill your airplane with your beautiful sliced fruit. Looks like you’re ready for (a delicious) takeoff!